Attendees had the opportunity to interact and explore what hands-on learning means at Lakehead University. The theme of Lakehead University’s 2018 Report to the Community was Engage. Explore. Excel. The annual luncheon at Hawk Ridge Golf Club on December 5, featured a talk-show style presentation hosted by Lakehead Orillia Principal, Dr. Dean Jobin-Bevans, and interviews with some of the exceptional people who helped make the last year a special one. Guests included Lakehead Orillia criminology program coordinator Dr. Alana Saulnier, alumnus Andrew Petras, a graduate of the Commerce program, and current international student Boluwatife Fabanwo. As an international student arriving at Lakehead Orillia, Fabanwo had a very different university experience than many students arriving for their first year on campus. He spoke about the shock he experienced pulling up in the taxi. “I didn’t realize Lakehead was in the countryside. I wasn’t used to such a small population – my hometown of Lagos, Nigeria, has over 20 million people,” said Fabanwo. After getting over the intense homesickness, Fabanwo used his experience to make new connections with faculty, staff, and his peers to make the most out of his time at Lakehead Orillia. Currently, a varsity soccer player and chair of the campus multicultural association, Fabanwo works hard to shed light on the different cultures around campus. Petras spoke about how an unspoken commitment from a faculty member convinced him to take the road less travelled and go to Lakehead University. “I knew there were going to be growing pains coming to Lakehead Orillia because it was so new, but I looked at it as an opportunity to put my footprint on campus,” he said. After graduating from Lakehead in 2013, Petras put that tenacity and commitment into his own career. Today, managing a growing financial services business in Simcoe County. Saulnier brought perspective to the issue of police accountability with discussion about her current year-long research project with Durham Regional Police Service around the effect of body worn cameras. “It’s incredibly important that we evaluate the techniques our legal authorities are using, and that they are also evaluating the practices they are using, to produce better evidence-based policy so our legal system is productive and for us,” she explained. The Report to the Community was a chance to celebrate the University’s many successes, including the incredible financial impact that Lakehead has on the province. Lakehead University adds approximately $1.4 billion per year to Ontario’s gross domestic product. The annual economic impact of the University’s Thunder Bay campus on the province was $1.3 billion, while its Orillia campus contributed $122.7 million. Lakehead University is responsible for 6,277 full-time equivalent jobs. “The Report to the Community is a chance to celebrate the year’s successes and connect with the communities within Northwestern Ontario and Simcoe County,” said Ross Murray, Q.C., Chair of Lakehead University’s Board of Governors. Dr. Moira McPherson, President and Vice-Chancellor, highlighted the new strategic plan and the University’s exceptional faculty, staff and students, and thanked everyone who has helped the University achieve greatness. She also acknowledged how Lakehead is helping students succeed in a fast-paced, competitive world. Visit openyourworld.ca to view Lakehead University’s Report to the Community. 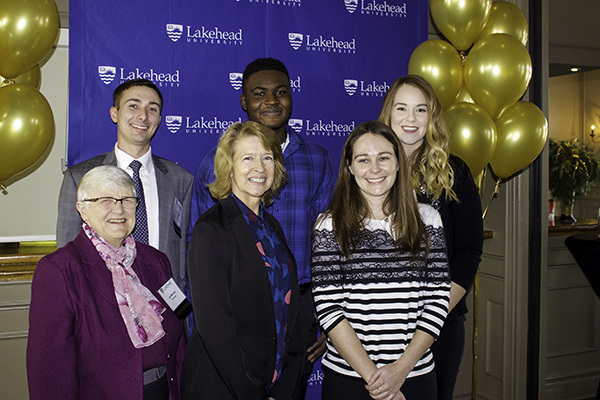 (Pictured below) Lakehead University Chancellor Lyn McLeod (left) and President and Vice-Chancellor Dr. Moira McPherson (second from left) are pictured with (from left) alumnus Andrew Petras, current student Bolu Fabanwo, criminology program coordinator and professor Dr. Alana Saulnier, and third year criminology student and event emcee Courtney Holmes. Media: For more information or to request an interview, contact Jaclyn Bucik, Marketing & Communications Associate, 705-330-4008 ext. 2014 or jaclyn.bucik@lakeheadu.ca.